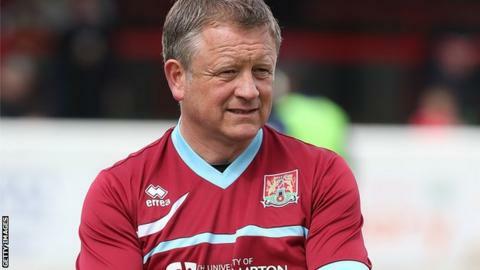 Northampton Town manager Chris Wilder says that signing strikers is his priority this summer. His side only netted 42 goals this season, the joint lowest in League Two, with midfielder Darren Carter and loanee Luke Norris top scorers on five. Wilder told BBC Radio Northampton: "We've got to get another 30 goals. We need to be more clinical, and I'm sure we can be if we get our targets in. "If we want to challenge, we've got to have one who'll get 15 to 20 goals." Having reached the play-off final at Wembley last season, the Cobblers struggled this term and were in serious danger of relegation to the Conference Premier before escaping in the final weeks of the campaign. Wilder was interested in taking former Northampton striker Adebayo Akinfenwa on loan from Gillingham at the start of the year, and said the 32-year-old was the kind of player they have relied upon in the past. Two of the three teams who were automatically promoted from League Two had a 15+ goal striker in their ranks. Only relegated Torquay scored as few as the Cobblers last season, so the problem is an obvious one. But fans will be encouraged that the manager is talking so confidently about it being remedied for next season before a signing has been made. "The club have had Bayo and a guaranteed 15 to 20 goals a season," continued Wilder, who took over in January. "That's obviously made the difference between being an average side to one pushing into the play-offs and getting up. He was a target, but we're looking at a whole host of players. "We're an attractive club to join and we're ambitious. Since Alan Knill and I came in, we're one of the form teams in the league and players want to join clubs that are going forward. "The chairman wants promotion and we all set out sights on doing well. If we can attract the right players, I'm sure we can be around that top part of the table." The club have so far offered new deals to four players for next season, with another 11 still under contract, while eight have departed. One of those staying at Sixfields is midfielder Ian Morris, who made enough appearances to trigger an extension to his deal. "I was never under any pressure not to play him, and we most probably would've offered him a new contract even if that clause wasn't in his contract," Wilder added.